One thing can’t be denied about Vijay Iyer: he is endlessly creative when it comes to the kinds of projects he is willing to undertake. Within the last few years alone, he’s done a record drawing on classical Indian musical elements for inspiration (Tirtha), one in which he included covers of Michael Jackson and Heatwave alongside more conventional jazz fare like Herbie Nichols and Duke Ellington (Accelerando), and then last year’s intriguing effort with occasional collaborator Mike Ladd, setting the poetic reflections of U.S. veterans to stirring soundscapes (Holding it Down: The Veterans’ Dreams Project). So it’s not at all surprising to see him shifting gears yet once again, as he tackles a ten-part composition for piano and string quartet, one that presents a challenging but ultimately highly rewarding listening experience. 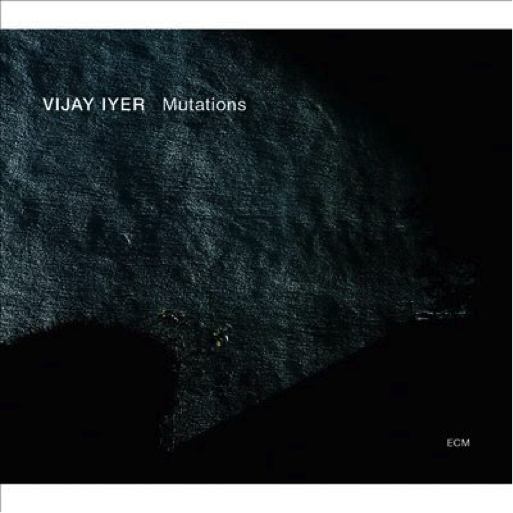 The album begins with Iyer alone on piano, revisiting a piece he first recorded in 1995 (“Spellbound and Sacrosanct, Cowrie”); it’s probably the most jazz-influenced piece on the record, as Iyer offers blues-inflected rubato playing at a languid, thoughtful pace. This is followed by “Vuln, Part 2,” another solo piece, but with an interesting use of electronics to supplement his playing. We then get to the meat of the record, the “Mutations” suite, itself first performed by Iyer in 2005, and built around the kinds of devices Iyer has always liked to use: a strong rhythmic pulse as a foundation, with a lyrical melodic sensibility, and with repetitive phrases that subtly evolve and extend out in different directions, sometimes almost imperceptibly. In this way, the title of the suite is a metaphor for Iyer’s compositional strategy in general. The first part of the suite, “Air,” illustrates the above qualities nicely. I have to admit when I first saw the personnel listed on the record and noticed Iyer wasn’t using a percussionist that I feared something crucial would be missing, since Iyer loves to highlight drummers and other percussionists on his recordings. But “Air” definitely maintains the strong rhythmic thrust of Iyer’s music, as the track begins with engaging, repeated phrases in the strings that drive the piece forward and provide it with plenty of momentum. A beguiling melodic statement by one of the violins also illustrates the lyrical side of Iyer’s writing rather nicely. It’s a highly stimulating and fascinating piece—and Iyer doesn’t even play on it. When he does come in during the remainder of the suite, it’s often as much to offer well-placed and integral contributions to the work as a whole as it is to demonstrate his pianistic chops. (And the role of Iyer’s added electronics are as important as his piano improvisations, as on the sixth part of the suite, “Chain,” for which Iyer uses what sounds like an electronic tabla track to support the quartet and his piano work.) While Iyer’s playing is strong and vibrant throughout, it’s always in service to the group as a whole. In other words, this really isn’t a “Vijay Iyer with Strings” record, but rather a true ensemble endeavor. There are wonderful moments throughout the suite that definitely require repeated listenings to detect and appreciate fully. This is a great example of the virtues of the pristine ECM aesthetic, where a nice pair of headphones will open up subtleties and nuances of the recording that might otherwise be missed—such as Iyer’s brilliant use of electronic loops on the sixth part of the suite, “Automata,” where he takes recorded passages by the strings and plays them back, creating an exhilarating effect where the distinction between the “live” strings and the recorded loops blurs marvelously. It’s characteristic of the perceptive and delicate way in which Iyer uses electronics throughout the suite. As good as the record is, it does seem in some respects like a preliminary realization of an artistic approach that will continue to develop and mature in subsequent iterations. The most fascinating part of the Mutations suite is in some ways the seventh (“Kernel”), when one can hear the members of the string section working a bit more freely with the material, and leaving the (highly) rigorous notation of the other sections of the suite behind. It’s a moment in which we can see the lines between the composed and the improvised aspects of the suite finally dissolve—something which is hinted at in other places on the disc but never fully realized. It will be interesting to see if Iyer can continue moving in this vein in the future, taking the demands of classical composition and filtering them more extensively through freer improvisational strategies. We’ll have to see. In the meantime, this remains a promising gesture in that direction, and it’s another very successful entry in Iyer’s growing and inspiring catalogue. Wonderful music, great review, Troy (as usual).